Winner of the Roald Dahl Funny Prize 2010! 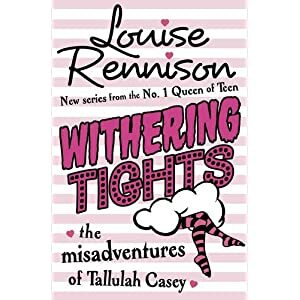 The misadventures of Tallulah Casey… Hilarious new series from Queen of Teen – laugh your tights off at the (VERY) amateur dramatic antics of Talullah and her bonkers mates. Boys, snogging and bad acting guaranteed! Picture the scene: Dother Hall performing arts college somewhere Up North, surrounded by rolling dales, bearded cheesemaking villagers (male and female) and wildlife of the squirrely-type. On the whole, it’s not quite the showbiz experience Tallulah was expecting… but once her mates turn up and they start their ‘FAME! I’m gonna liiiiive foreeeeeever, I’m gonna fill my tiiiiights’ summer course things are bound to perk up. Especially when the boys arrive. (When DO the boys arrive?) Six weeks of parent-free freedom. BOY freedom. Freedom of expression… cos it’s the THEATRE dahling, theatre!! You have perhaps noticed that it doesn't say "review" on the title of this page. This book showed up in my mail from the publisher, and the title appealed to me; Wuthering Heights is one of my favorite books. I have read almost all of Withering Tights, but the problem is I don't get the book, and that is not the book or the author's fault. I read very little comedy books, it's not that I am not a funny person but it is not my cup of tea. And that became obvious once I started reading; I did not get a lot of the jokes - and I think that is due part to my maternal language and/or place of living. It would not be fair to the book and the author if I reviewed it on that basis. But, the book deserves a well written review - I have read some reviews for it already and it seems like people are loving it. I have decided to give my copy away so another person, who understands the jokes better than me, can enjoy it and review it. The winner will be chosen using Random.org. The contest will be closed Thursday 10th of March at 24.00 CET. Everyone can join - this is an international contest. Please make sure to put the name of your blog after your name/nick in the spreadsheet, thank you.